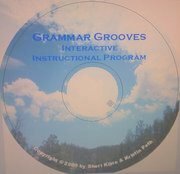 Grammar Grooves is an enjoyable series of presentations designed for use on an interactive whiteboard. Individual students tap on the correct words in the sentence to make it a kinesthetic learning activity. In response to their touch, the symbol to identify the part of speech appears. The accompanying sounds and digital emphasis will amuse them while increasing likelihood of memory acquisition. In a classroom without an interactive whiteboard, Grammar Grooves can easily be used with a computer and a projector. This is a whole class activity which can also be used on an individual basis with a single computer.